In an opinion editorial in a national publication, World Trade Center of New Orleans CEO Caitlin Cain and Port of South Louisiana Executive Director Paul Aucoin explain that, for Louisiana, there may be no more critical economic issues than agriculture and infrastructure and hope that both U.S. legislators and the Trump administration come to support infrastructure improvements, especially that of the Mississippi River, the nation’s most vital shipping channel. The piece, incorporated below, was published by Real Clear Policy, a highly influential online journal read by Washington, D.C. insiders including members of Congress, congressional staff, administration officials and policy experts.In Louisiana, Agriculture & Infrastructure Are LinkedBy Caitlin Cain & Paul AucoinThis week, the White House is pushing its infrastructure plan, which could have major impacts across the United States. While Washington remains politically divided, both parties have expressed support for overhauling the nation’s infrastructure, because all sides see a need to improve our roads, bridges, ports, and other modes of transportation. Businesses throughout the nation are paying close attention. We believe issues important to Louisiana businesses are also vital to industries throughout the nation. In Louisiana, there may be no more critical economic issues than agriculture and infrastructure. And the two are inextricably linked. This is because our state grows millions of tons of farm products every year and exports them across the globe from ports along the Mississippi River. 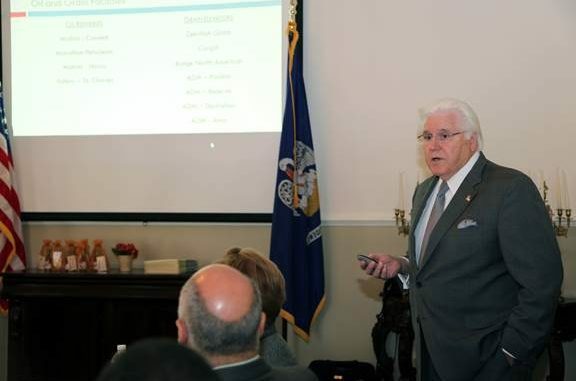 On these matters, businesses in Louisiana will be greatly impacted by the budget and several bills and proposals working their way through Congress and the Trump administration. The United States, in addition to feeding our domestic population, is increasingly cultivating fields to feed many global populations facing food deficits. The 2014 Farm Bill dedicated only $1.8 billion in spending to support international trade. This represents less than 0.5 percent of the total budget — a fractional amount compared to its economic magnitude as one in every three acres planted in the United States is exported. As the current Congress considers the upcoming Farm Bill, it is paramount they devote the necessary resources to both international trade and food aid. The trade component of the Farm Bill is particularly significant to Louisiana as our state is one of the largest agricultural exporters and maintains a $6.8 billion trade surplus in chemical and agricultural exports to countries such as China. In fact, more than 30 states rely on the Mississippi River to export their grains globally. In 2016, over $20 billion in agricultural exports were handled through Louisiana ports. A delay in the movement of these goods is extremely costly to shippers and farmers alike, so the upkeep and maintenance dredging of this waterway is critically important. When the primary Shipping Channel on the river is not deep enough, each ship has to operate with about 1 to 5 feet less of cargo. Each foot of cargo equates to a loss of around $1 million. Spread those losses over thousands of ships, and buying American grains like corn, soy, and wheat becomes more expensive and less profitable. Eventually, nations around the globe that import millions of tons of American grains may choose to get their food elsewhere. Because keeping the Mississippi River Ship Channel deep enough for the largest cargo ships is so important, it is essential that the federal government allocates the funding for the U.S. Army Corps of Engineers to dredge the River in key areas. Undoubtedly, dredging is a national security issue with major global food chain and energy supply implications; understanding this relationship is paramount especially as Congress and the White House consider a large infrastructure package, including how to better allocate funds from the Harbor Maintenance Trust Fund (HMTF). Currently, the HMTF has over a $9 billion dollar surplus because Congress has not mandated that those dollars be used for port maintenance. Because agriculture and infrastructure are so important for Louisiana — and the economic well-being of the entire nation — we are hopeful that the Congress and the Trump administration will come together to pass legislation that recognizes the importance of trade, food aid, and transport. Businesses in our state are depending on our leaders, and we look forward to working with our congressional delegation to ensure Washington makes the right decisions to keep Louisiana’s economy moving forward.Caitlin Cain is the CEO of the World Trade Center of New Orleans (WTCNO), a nonprofit organization of over 1,000 corporate and individual members dedicated to fostering and promoting international business and trade in Louisiana.